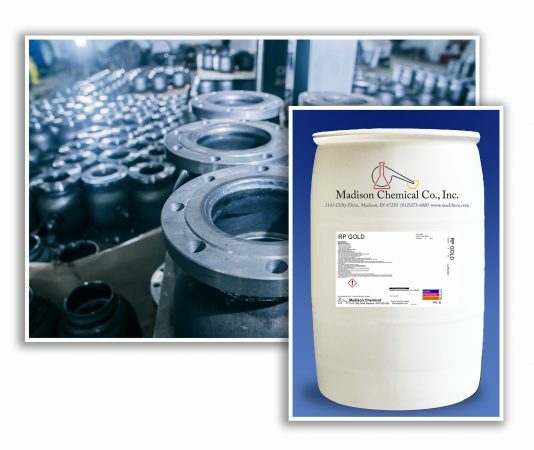 Madison Chemical introduces RP GOLD, a versatile water-based rust preventive that provides long-term indoor storage protection for ferrous and copper alloys. Applied to previously cleaned parts by immersion, manual spray or recirculated spray methods, RP GOLD leaves a nearly invisible, dry-to-the-touch film that provides up to 4 weeks of protection (or longer when used at higher concentrations). This proven, water-based compound contains no oil or solvent, resulting in low use. Environmentally friendly RP GOLD does not contain nitrite, silicate, phosphate, hydroxide, silicone, chlorine, phenol, or sulfur. It is ideal for treating parts prior to further fabrication or additional chemical treatment such as conversion coating or electroplating. RP GOLD is safe for ferrous and copper alloys when used as directed. For most applications, it is used at five-to-10 per cent by volume in water from 70°F. to 160°F. Heating the solution will lessen the time required for drying and may improve overall protection results. Concentrations up to 20 per cent may be used for longer rust protection time. Prolonged contact (greater than 24 hours) with aluminum and zinc alloys may case a staining effect with some reaction. Determine compatibility with soft metals/alloys prior to using RP GOLD on a production scale. Treated parts should not be stacked or nested together until dry. Drying methods such as high velocity/high pressure and centrifugal spinning may reduce film thickness and subsequently lessen rust protection and should be tested beforehand.